Next we will create the root certificate which last for 1024 days (around 3 years). It will produce a file called myRootCA.crt. This is the file that you need to put on workstation or client application. -subj "/C=ID/ST=Bali/L=Badung/O=My Company Inc./OU=IT Security/CN=My Root CA/[email protected]"
To prevent interactive prompt we use -subj arguments. Verify the certificate to make sure the generated file is correct. Every time you need to generate new self certificate, you should use these two files myRootCA.key and myRootCA.crt as the Certificate Authority to sign. Create a private key for certificate that we want to generate. It will produce a file called mycooldomain.local.key. Second step is to generate the Certificate Signing Request (CSR). The most important thing when creating CSR is the Common Name. This option is used to specify the hostname which this certificate should be issued. -subj "/C=ID/ST=Bali/L=Badung/O=My Company Inc./OU=My Cool Department/CN=mycooldomain.local/[email protected]"
The last step is to generate signed certificate by using the CSR we just created in addition with the keys from the root CA. Command above will produce a file called mycooldomain.local.crt. You can use this file and mycooldomain.local.key in server application like Apache or Nginx. We will create new virtual host for domain mycooldomain.local. Run all these commands as root. Create the virtual host file. Hit CTRL-D to finish writing the contents when using tee command. Change the path according where you store the certificate file. If you don't have DNS server than just add mycooldomain.local into /etc/hosts. 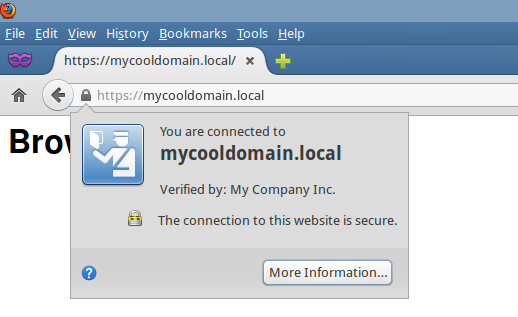 Try to visit https://mycooldomain.local, Firefox will says that this site is verified by My Company Inc.